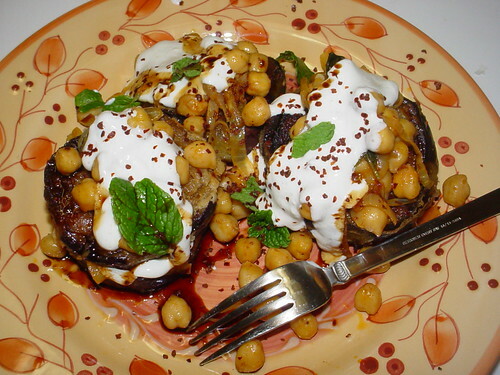 I think chickpeas, eggplant and yogurt are a Mediterranean match made in heaven. In one of Paula Wofert’s books, “The Cooking of the Eastern Mediterranean“, she has a recipe for an eggplant and chickpea stew that I love. That one is more like a thick Caponata and includes tomatoes, but it is sort of an inspiration for this combo here. I first salted the thick cut eggplant and let them drain overnight. After rinsing and drying them, I marinated them in a mixture of pomegranate molasses, garlic and thyme. I let them sit in the marinade till I got back from work. Looking back at this, I should’ve broiled the eggplant. Instead I floured and pan fried them in my cast iron skillet. Broiling cooks them more evenly and makes them less greasy. The chickpeas came from a can (almost all canned beans and legumes are very decent products) and were quickly sautéed with onions, garlic, cumin, paprika and Aleppo pepper. The yogurt sauce is a mixture of strained thick homemade yogurt (Labni or Labneh), some Tahini (sesame paste), garlic, cumin and lemon juice. To serve it, I mixed in some fresh mint leaves with the chickpeas. I then made stacks with the eggplant slices and the chickpeas, sandwiching some sauce in between. I finished the dishes with more sauce, a drizzle of pomegranate molasses and a sprinkling of Aleppo pepper. We ate it with pita bread, an awesome and satisfying dish. Beautiful photo and a great idea! I can’t wait to try your version. BTW I have started “frying” eggplant slices on a serrated teflon griddle. You get blackened grid marks as well as the taste of a fried slice..
A question about the marinade – do you refrigerate the eggplant in the marinde? BTW, i’m from H-town too. Have you been over to the new bigger Phonecia on Westheimer? Love that place! I did not refrigertae the eggplant this time. I left them in ziplock bag in a bowl overnight. If you are going to leave them to marinate more than 24 hours, it is probably a good idea to refrigerate. Phonecia is pretty cool. Problem is that it’s too much out of the way for me to go there regularly.